Why Does Your Newborn Baby Sneeze All the Time? Does your newborn baby seem to sneeze a lot? As the parent of a newborn, you are probably on alert for any signs that your baby is getting sick. 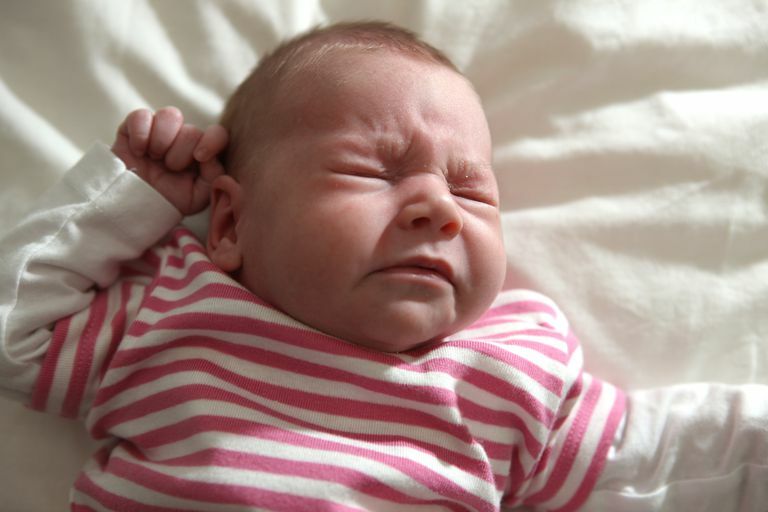 You may wonder whether sneezing is the sign your baby is getting her first cold. Should you take her to the doctor if she doesn't have any other symptoms? More than likely the fact that your baby sneezes so much is nothing to be worried about. In fact, you might be reassured to know that her little body is working exactly as it should be. By their nature, newborn babies are nose-breathers. They don't start breathing through their mouths until they are three to four months old. In light of that, they need to clear their nose often. Newborns have little, tiny noses. Tiny noses mean tiny nasal passages. That little pathway can be easily clogged with lint from clothing and blanks, pet hair, dust, residue from spit up, etc. As in adults, their nasal passages are designed to strain out particles and eject them so they don't end up in the lungs. Babies sneeze a lot to keep that passage clean. Newborns can't snort or sniff. Their only option to clear their nasal passages is to sneeze. If your baby sneezes aren't accompanied by any other signs of illness, then more than likely you don't have anything to worry about. Instead, be reassured that her little body is behaving exactly as it should be. Sneezes will naturally help eject germs and particles from the nasal passages and keep air flowing. You might even notice a sneeze when you are breastfeeding because your baby has pressed one nostril shut against your skin. Your baby might sneeze to open it up again. In addition to clearing amniotic fluid from their air passages soon after birth, babies also end up with milk and saliva in their nasal passages from feeding. They don't swallow everything and often spit up or regurgitate what they've swallowed, and it can end up backing up into the nose. Doctors and advice nurses say they get lots of calls about babies with stuffy noses and sneezing. As long as your baby isn't having any obvious trouble breathing, it's better to not intervene with saline drops or a nasal aspirator. Let your little one's body operate according to the way it was designed. Those sneezes will help keep air moving in and out. Baby sneezes by themselves are not a reason to call the doctor. Your baby will sneeze simply as part of the normal way they keep their breathing passages open. However, in combination with other symptoms, it might point to a cold or infection. If your baby is having trouble breathing, is coughing, is sneezing continually, has a fever, isn't eating as much as usual, or is sleepier than usual, consult your doctor. Stuffy nose, sneezing, and hiccups in newborns - Fairview health services. https://www.fairview.org/HealthLibrary/Article/88229.